Lipid phosphate phosphatases (LPPs) are integral membrane proteins believed to dephosphorylate bioactive lipid messengers, so modifying or attenuating their activities. Wunen, a Drosophila LPP homologue, has been shown to play a pivotal role in primordial germ cell (PGC) migration and survival during embryogenesis. It has been hypothesised that LPPs may form oligomeric complexes, and may even function as hexamers. We were interested in exploring this possibility, to confirm whether LPPs can oligomerise, and if they do, whether oligomerisation is required for either in vitro or in vivo activity. We present evidence that Wunen dimerises, that these associations require the last thirty-five C-terminal amino-acids and depend upon the presence of an intact catalytic site. Expression of a truncated, monomeric form of Wunen in Drosophila embryos results in perturbation of germ cell migration and germ cell loss, as observed for full-length Wunen. We also observed that murine LPP-1 and human LPP-3 can also form associations, but do not form interactions with Wunen or each other. Furthermore, Wunen does not form dimers with its closely related counterpart Wunen-2. Finally we discovered that addition of a trimeric myc tag to the C-terminus of Wunen does not prevent dimerisation or in vitro activity, but does prevent activity in vivo. LPPs do form complexes, but these do not seem to be specifically required for activity either in vitro or in vivo. Since neither dimerisation nor the C-terminus seem to be involved in substrate recognition, they may instead confer structural or functional stability through dimerisation. The results indicate that the associations we see are highly specific and occur only between monomers of the same protein. Lipid phosphate phosphatases (LPPs) are integral membrane proteins that dephosphorylate a number of bioactive lipid phosphates involved in lipid signalling pathways. LPPs differ from the related Type 1 phosphatidic acid phosphatases (PAPs) in their biochemical properties and sub-cellular distributions. Found in the cytosol, Type 1 PAPs are activated by translocation to the endoplasmic reticulum, are sensitive to N-ethylmaleimide (NEM) inhibition and are magnesium ion dependent. Conversely, the three known LPP isoforms (1, 2, 3) are magnesium independent and NEM insensitive . A number of studies alongside hydropathy analyses have indicated that these enzymes span the membrane six times, with their N- and C-termini residing in the intracellular space. Domains known to be required for catalytic function, are located on the second and third extramembrane loops and evidence suggests that the LPPs may function as 'ecto-enzymes' . Widespread in mammals, LPPs have also been identified in Saccharomyces and Arabidopsis [3, 4]. wunen (wun) and wunen-2 (wun-2) encode Drosophila LPP homologues that play pivotal roles in the regulation of primordial germ cell (PGC) migration and survival. Whilst loss of wun and wun-2 results in PGCs scattering upon exiting the midgut at stage 10 [5–7], mis-expression of either in the mesoderm repels PGCs from this otherwise attractive tissue, and results in PGC death. PGCs that survive show perturbed migration with the majority failing to reach the somatic gonad. This suggests that these proteins degrade an attractive substrate that is a spatial guidance cue required for PGC survival. It has been hypothesised that the LPPs oligomerise and may function as hexamers [8, 9]. We were interested in exploring this hypothesis, and show here for the first time that Wun can form dimers, that these interactions are prevented by point mutation of a catalytic site, and require the C-terminal thirty-five amino-acids. Furthermore we demonstrate that this dimerisation is not required for activity in vivo or in vitro, but that the presence of an intact catalytic site is required for dimerisation. We show that whilst mLPP-1 and hLPP-3 also appear to homo-dimerise, none of the LPPs examined hetero-dimerised, pointing to a highly specific self-interaction. Finally we show that addition of a trimeric myc tag (M3) abolishes activity in vivo but not in vitro, indicating that it may change the ability of Wun to recognise its substrate. We had Wun tagged with both GFP and a trimeric myc tag repeat (M3), as well as WunD:248>T - a mutation in a conserved domain which we have shown removes activity both in vitro and in vivo. We also had access to M3 and GFP tagged versions of hLPP-3, mLPP-1 and Wun-2 . In addition we cloned a truncation of the last thirty-five C-terminal amino-acids which we named WunD2 (Fig. 1). These were cloned into the pUAST vector  and sequenced. Drosophila S2 cells transfected with each cDNA and the ubiquitous Actin5C-GAL4 driver were lysed and predicted protein sizes confirmed. Schematic diagram of Wun. The D:248>T mutation and D2 truncation are indicated. Conserved residues required for catalysis are shown in red . We investigated interactions between Wun monomers using an anti-myc immunoaffinity resin. S2 cells co-transfected with WunM3, WunGFP plus Actin5C-GAL4 were lysed in 0.1% triton X-100 buffer and incubated with the resin before extensive washing to remove unbound protein. The resin was then subjected to Western analysis (Fig. 2a). No WunGFP is detected in the final wash but a strong signal is seen in the lane containing the resin. As the resin selectively captures myc epitope tagged proteins, the WunGFP must be associating with the captured WunM3. We conclude that wild-type Wun can interact with itself and form complexes. Resin incubated with WunGFP alone shows no capture confirming that the resin does not recognise the GFP epitope. The protocol was repeated with 1% triton X-100. 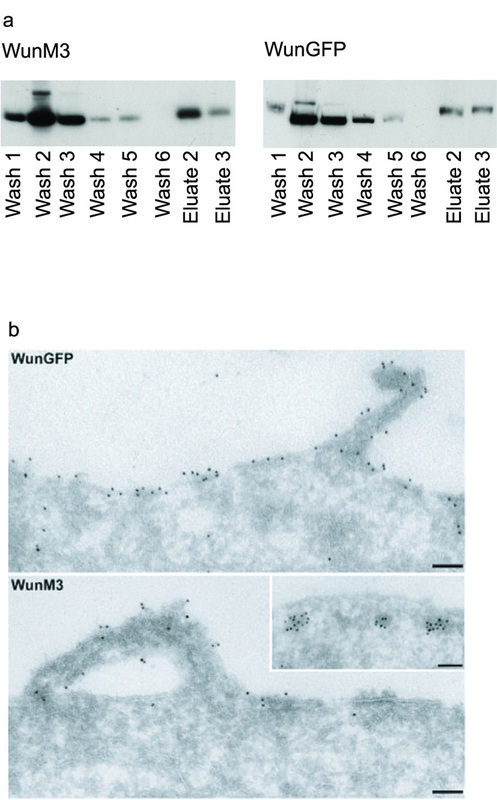 The results show loss of association – no WunGFP is detectable, whilst WunM3 is still captured (Fig. 2b). This again confirms that the resin does not recognise GFP tagged proteins, and indicates that the association between Wun monomers can be disrupted by increasing the concentration of detergent in the extraction buffer. We examined the specificity of the interaction in 0.1% triton lysis buffer, and found that Wun does not form associations with its closely related counterpart Wun-2 (data not shown). Furthermore, whilst mLPP-1 and hLPP-3 can both self-interact (Fig. 2c), neither of them associate with Wun (Fig. 2d). This indicates that what we observe is a highly specific interaction which can not occur between closely related but non-identical proteins. We tried several times to investigate interactions between monomers of Wunen-2, but were unable to either express the protein at adequate levels, or to capture that protein that was expressed. Immunoprecipitation assays (a) Cell lysates co-transfected with WunM3 and WunGFP (first 3 lanes of each gel) or WunD2M3 and WunGFP (lanes 4, 5 and 6). 'Load' is unbound protein removed from the resin after the 2 hour incubation. 'Wash' is an aliquot of the final buffer change. 'Capture' is an aliquot of the resin. This shows capture of WunM3 and WunD2M3 by the resin in the left hand blot. In the right hand blot, however, WunGFP is only detected in the lane corresponding to the WunM3 capture: there is no WunGFP detectable in the lane corresponding to the WunD2M3 capture. This indicates an association between full length Wun that is abolished by the truncation. The lane from cells transfected with only WunGFP (lane 7) shows that the resin does not capture the GFP tag. (b) 1% triton X-100 breaks the association – WunM3 no longer pulls down WunGFP. (c) mLPP-1M3 is captured and pulls down mLPP-1GFP indicating an association. This is not seen between WunM3 and hLPP-3GFP, or mLPP-1M3 and WunGFP (d). TL refers to 'total lysate' – an aliquot of the complete lysate prior to incubation with the resin. (e) WunD:248>TM3 does not pull down WunGFP. (f) Incubation of WunM3 or WunGFP in PFA indicates monomers (M) at 39 KDa/51 KDa and dimers (D) at 70 KDa/100 KDa plus higher order oligomers. TL = total lysate not treated with PFA. (g) WunD2GFP and WunD:248>TGFP do not form oligomers with PFA, whereas hLPP-3GFP and mLPP-1M3 (h) do. To determine the effect of the loss of in vitro and in vivo activity, we co-transfected S2 cells with the catalytic null WunD:248>TM3, WunGFP and Actin5C-GAL4 and immunoprecipitated them as before. The association was blocked (Fig. 2e). This indicates that the D:248>T mutation which removes catalytic activity also prevents dimerisation. We repeated the protocol with WunD2M3 plus WunGFP and Actin5C-GAL4 and found that deletion of the C-terminal thirty-five amino-acids also blocks dimerisation (Fig. 2a). To investigate the order of oligomerisation, cells transfected with either WunM3 or WunGFP were incubated with 3% para-formaldehyde (PFA) before Western analysis. This again confirms that Wun dimerises, showing the monomer, and a dimeric form (Fig. 2f). Whilst we can also identify higher order aggregates by this method, it is unclear as to whether these occur normally. When repeated with the catalytic null and the truncation, dimerisation is again lost whilst mLPP-1 and hLPP-3 still show dimerisation under these criteria (Fig. 2g,2h). We believe that collectively these results rule out the possibility that the self-associations we observe under these criteria are artefacts of the expression system, and instead point towards specific self-interactions between identical protein monomers. We now had the wild-type multimeric protein (Wun) and a monomeric form (WunD2) and could address which is active in vivo by examining the functional consequences of blocking protein-protein association in both a biochemical and the PGC migration/survival assay. In order to confirm that our constructs were functional, we purified each protein and tested them in a phosphate release assay on a known substrate, LPA. All samples were subsequently analysed by densitometry to examine relative protein amounts. The results indicate that under these conditions WunD2M3 is slightly more active than WunM3, indicating that dimerisation is not required for catalysis in this biochemical assay (Table 1). Relative activities for each protein calculated from the LPA phosphate release assay and densitometry. Each immunocaptured enzyme was incubated in triplicate with LPA in the PiPer® phosphate release assay, and the nMoles phosphate released for each individual sample calculated from a standard curve. The means of the three readings for each enzyme is presented, +/- SD. Less than 3% of the total LPA was broken down in any of the experiments. The density for each individual sample on a Western blot was calculated using Bio-Rad Quantity One, and used to calculate nMoles PO4 released per unit density. The data presented is the mean of these values, +/- SD. This was then converted into relative activity. LPPs active in this assay, however, will not necessarily function in vivo. To examine the ability of the truncated, monomeric form to act on the PGC specific survival factor in Drosophila embryos, we generated transgenic flies with WunD2GFP and WunD2M3 and crossed them to the mesoderm driver Twist-GAL4 . Ectopic expression of WunD2GFP gave a similar phenotype to ectopic expression of full-length Wun, with scattered germ cells, a failure to form functional gonads, and a marked reduction in germ cell number (Fig. 3a,3b,3c,3d,3e,3f). This indicates that neither dimerisation nor the C-terminal thirty-five amino-acids are required for activity in vivo. Surprisingly, expression of WunD2M3, which has activity in the LPA assay, had no affect on PGC migration or survival (Fig. 3h). We mis-expressed WunM3 in vivo and found that this too had a total loss of function, despite high levels of protein in the mesoderm and activity in the in vitro LPA assay (Fig. 3i). This indicates that in vivo, this myc tag prevents the function of a previously active protein and cannot be relied on as a passive tag. These results show that catalytic activity as assayed biochemically, is not a true reflection of activity as assayed in vivo. Ectopic expression Ectopic expression. Embryos a-c are viewed laterally with the posterior pole to the right, embryos d-i are viewed dorsally. Expression of WunD2GFP (a) at stage 10 has a similar phenotype to WunGFP (b) with an early and dramatic loss of PGCs compared to wild-type (c). By the end of embryogenesis, neither WunD2GFP (d) nor WunGFP (e) expressing embryos have formed gonads, as opposed to a wild-type embryo at the same stage (f). Expression of WunD:248>TGFP (g), WunD2M3 (h) or WunM3 (i) gives no discernable phenotype with all embryos forming two distinct gonads. Wild-type embryos have not been stained with anti-GFP and consequently show no blue staining. As it has been indicated that the LPPs may function as ecto-enzymes, we wanted to confirm that neither tag interfered with trafficking to the cell surface. We could then rule out the possibility that the M3 tag prevented WunM3 from reaching the cell surface precluding access to its substrate. We achieved this by incubating intact cells expressing either WunM3 or WunGFP with NHS-biotin – a cell impermeable biotin that labels only those proteins expressed on the cell surface – and running lysates over a over a monomeric biotin binding avidin column before Western blotting (Fig. 4a). Densitometry analysis by Bio-Rad Quantity One Software indicated that similar percentages of each protein were present at the cell surface (data not shown). 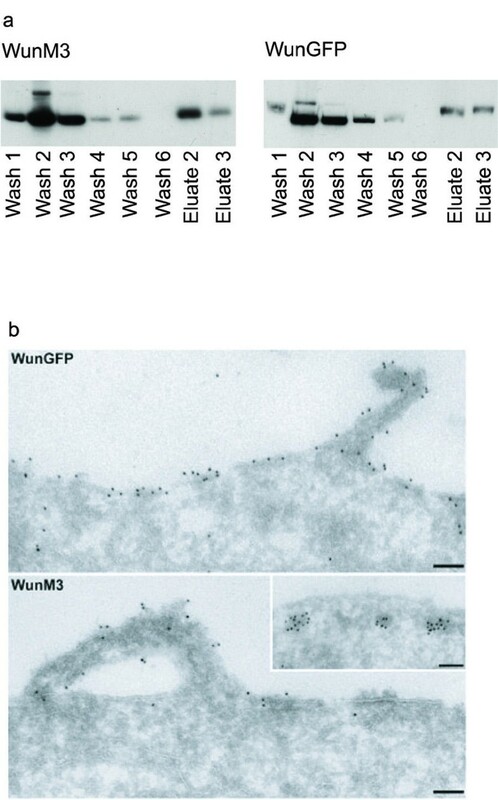 Examination by electron microscopy (EM) shows WunGFP both on the cell surface and in large, internal, multi-vesicular structures, whereas WunM3 is found in both these locations and is also associated with vesicles just below the plasma membrane (Fig. 4b). Proteins at the Cell Surface (a) Biotinylation of WunM3 and WunGFP at the cell surface. Washes = non-biotinylated proteins; Eluates = biotinylated cell surface proteins. We used internal tubulin as a negative control and the cell surface marker CD2 as a positive control (data not shown). (b) EM shows both proteins at the cell surface, with WunM3 present in sub-cortical vesicles. We have shown that the lipid phosphate phosphatase Wun dimerises, that a C-terminal truncation or mutation of a conserved catalytic residue prevents this association, and that dimerisation is not required for activity either in vitro or in vivo. We have also demonstrated that whilst hLPP-3 and mLPP-1 can both dimerise, none of the LPPs tested, including Wun-2 can form associations with Wun. We have recently demonstrated that though biochemically active on a number of substrates in vitro, mLPP-1 is inactive when ectopically expressed in Drosophila embryos, whereas hLPP-3 shows a similar phenotype to that of Wunen . These results indicate that although all of the isoforms tested are capable of forming multimeric complexes, it is unlikely that oligomerisation can account for the observed differences in bioactivity. This is the first time that a LPP has been shown to dimerise, although protein oligomerisation per se is not novel. Outer membrane phospholipase A (OMPLA) resides in an inactive, monomeric form in the outer membrane of gram-negative bacteria. Perturbation of the bacterial membrane activates the enzyme by reversible dimerisation  forming functional active sites, substrate binding pockets and essential calcium binding sites . Pre-incubation with increasing detergent results in dissociation into monomers and a 15-fold decrease in activity . Wun also forms dimers, which are dissociated by increasing detergent concentration, but the monomer remains active both in vitro and in vivo. Point mutations in the catalytic core of human arginase I breaks association between its monomers. As in Wun, monomers retain wild-type activity in biochemical assays . The mutated residue, involved in inter-monomer salt links, is believed to stabilise the multimeric structure since the monomer is less thermally stable and binds manganese with a reduced affinity. Although the absolute structure of the LPPs has yet to be determined, the superfamily is defined by three highly conserved domains proposed to form a 3-dimensional active site [16, 17]. 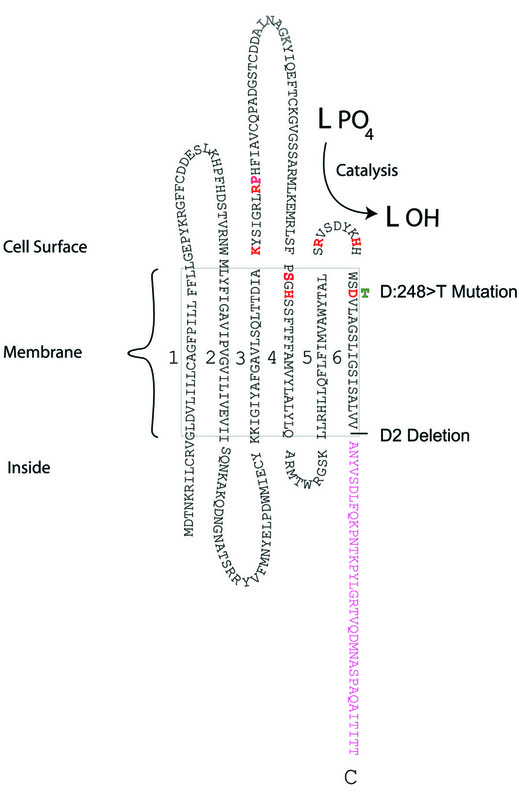 It seems possible that the D:248>T mutation may also break oligomerisation due to structural changes in the catalytic core. The core may serve two separate functions – provision of an active site, and stabilisation of the quartenary structure. This may be substantiated in the future by the use of alternative point mutations in other catalytically important residues. Truncation of the non-conserved C-terminal tail of avian sarcoma virus integrase (ASV IN) hampers multimerisation and results in loss of activity . In both ASV IN and arginase I, it is proposed that the catalytic core and the C-terminus interact to form complexes. This could account for the loss of dimerisation seen in WunD2 and WunD:248>T. The loss of catalytic function would then be directly due to mutating a residue essential for catalytic activity. Though the Wun monomer is active, we do not know if the dimer is active or inactive. It may be that Wun exists as both forms with dimerisation regulating activity or enzyme levels. Alternatively dimerisation may be required for wild-type function, but driving expression of the monomeric protein at unnaturally high levels in the mesoderm may over-ride this. That the M3 tag does not prevent catalysis on LPA, but absolutely prevents activity in vivo indicates caution should be applied in interpretation of biochemical data. Since the M3 tag does not prevent trafficking to the cell surface, it may instead introduce conformational or structural changes that prevent the enzyme from recognizing or associating with either the substrate, or an associating factor in the pathway. In conclusion we have observed dimerisation between full-length monomers of Wun. We removed the last thirty-five C-terminal amino-acids and found that this prevents dimerisation but does not inhibit activity in vivo or in vitro. This implies that neither dimerisation nor the C-terminus are involved in substrate recognition or selection, but may instead confer structural or functional stability. Furthermore the point mutation D:248>T removes both catalysis and dimerisation, which may point towards further structural determinants in the core domain. Since mLPP-1 and hLPP-3 can also self-interact, but cannot interact with Wun or each other, we conclude that the observed interactions are highly specific, and occur only between monomers of identical proteins. 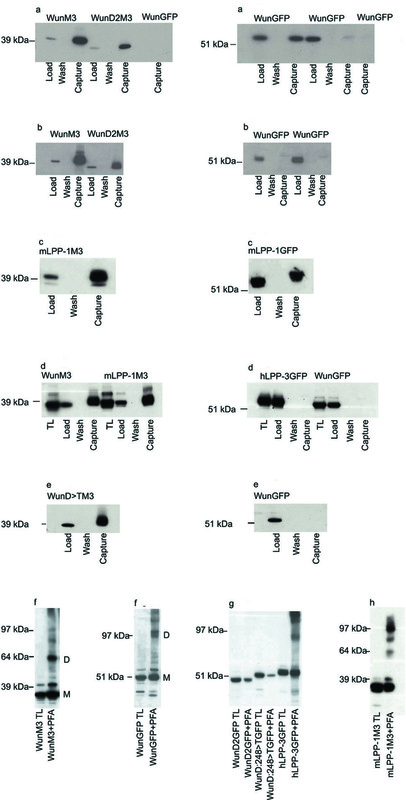 WunGFP was made in pEGFPN3 by Dr.Wada. WunM3 was made by annealing oligos encoding a trimeric myc tag repeat. The same myc tag was added to all constructs. WunD:248>T, WunD2 and mLPP-1 were made in our laboratory and the tags added using standard techniques – where we used PCR, oligonucleotide mutagenesis or linker insertion the coding region was sequenced and submitted to Genebank. Each was cloned into pUAST using standard restriction enzyme techniques. hLPP-3GFP was made using the construct in EGFPN3 of Dr.Wada. All tags were C-terminal. Drosophila S2 cells were grown in HyQCCM3 media (Perbio Science). We used the Effectene Transfection Reagent (Qiagen). 48 hrs post transfection, cells were washed in phosphate buffered saline (PBS), spun at 3000 rpm and lysed on ice in lysis buffer (0.5 M HEPES, 5 M sodium chloride, 1 M sodium fluoride, 0.5 M EDTA, 0.5 M sodium orthovanadate, 0.1% triton X-100, 2 mM NEM, Complete protease inhibitors (Roche)). Western blots used standard techniques. We used a mouse monoclonal anti-body to GFP (Roche) and mouse monoclonal 9e10 anti-myc (Laboratory for Molecular Cell Biology stock) plus HRP conjugated anti-mouse (Jackson ImmunoResearch Laboratories). Co-transfected S2 cells were lysed as before and an equal volume of lysate added to Anti-c-Myc Agarose Affinity Gel (Sigma). After incubation for two hours at 4°c, the resin was washed extensively and resuspended in 10 × volume cell lysis buffer. The same samples were loaded onto 2 gels; one was blotted for the myc tag, the other for the GFP tag. Cells were incubated at room temperature with 3% or 12% PFA for 30 or 60 minutes in PBS, quenched with 100 mM ammonium chloride, washed in PBS, lysed on ice and snap frozen in liquid nitrogen. We used the Molecular Probes PiPer® phosphate release assay (Cambridge Bioscience). Each reaction was performed in triplicate, using 50 μl of the anti-M3 resin containing the immunocaptured proteins. Assays were performed at 37°c and the fluorescence read in a standard platereader in a final volume of 100 μl at six time points during the assay period. The LPA control gave a small but constant value, which was subtracted from each of the samples. LPA (Sigma) in 50% ethanol was used at a final concentration of 500 μM in the supplied buffer plus 0.01%phosphate free triton X-100 (Sigma) plus 1 mg/ ml fatty acid free BSA (Sigma). To test the linearity of the detection system, phosphate standards were simultaneously run in triplicate. We examined activity at an arbitrary time point that appeared to fall within the linear range for the enzymes. The PO4 standards were converted to nMoles PO4 at this time, and used to produce a standard curve. This was linear, indicating that the detection system displays first order kinetics in the presence of up to 4 nMol PO4. A line of best fit was used to calculate the amount of PO4 released from each protein sample. Each sample was Western blotted and densitometry performed using Bio-Rad Quantity One software to compare relative protein amounts in each, on the same blot. Constructs were microinjected into White118 embryos and transformants recovered using standard techniques. We used mouse monoclonal antibody to GFP (Roche) plus by alkaline phosphatase conjugated anti-mouse (Jackson ImmunoResearch Laboratories) to stain protein expression blue, and chicken anti-vasa (Ken Howard) followed by biotin-conjugated anti-chicken (Jackson ImmunoResearch Laboratories) to label PGCs brown. S2 cells grown in 60 mm tissue culture dishes were fixed in 4% PFA. After scraping and pelleting, the fixed cells were embedded in 12% gelatine, infiltrated with 2.3 M sucrose and frozen in liquid nitrogen as described previously . 70 nm thick cryosections were labelled using either an anti-GFP antibody  followed by detection with 10 nm protein A-gold (EM Lab., Utrecht University, The Netherlands) or anti-myc antibody (9e10) followed by detection with rabbit anti-mouse conjugated to 10 nm gold (British Biocell Ltd, Cardiff, UK). Labelled sections were viewed using a transmission electron microscope (EM 420; Philips, Eindhoven, The Netherlands). We used Pierce No-Weigh™ Premeasured NHS-PE04 Biotin (Perbio Science). The reaction was quenched with 100 mM ammonium chloride. Cells were washed to remove unbound biotin, lysed on ice in 1.5 ml cell lysis buffer (1% triton X-100) and spun for 5 minutes at 3000 rpm, 4°c. The supernatant was applied to a Pierce Immunopure Monomeric Avidin column (Perbio Science) according to the manufacturer's instructions. Fractions were analysed by Western blot. An erratum to this article is available at http://dx.doi.org/10.1186/1471-2091-6-3. We thank Adrian Harwood, Jonathon Ryves, Martin Raff, Matthew Hannah, Shamshad Cockroft, Tom Kornberg and Gavin MacColl for help, advice and materials. CB performed the biochemical and biological analyses, the immunoprecipitation, cross-linking and biotinylation, and drafted the manuscript. PM helped with cloning, fly work and cell culture. LH performed the immunolabelling of cryosections and the EM. KH conceived of the study, oversaw the design and coordination, and cloned and tagged many of the constructs.